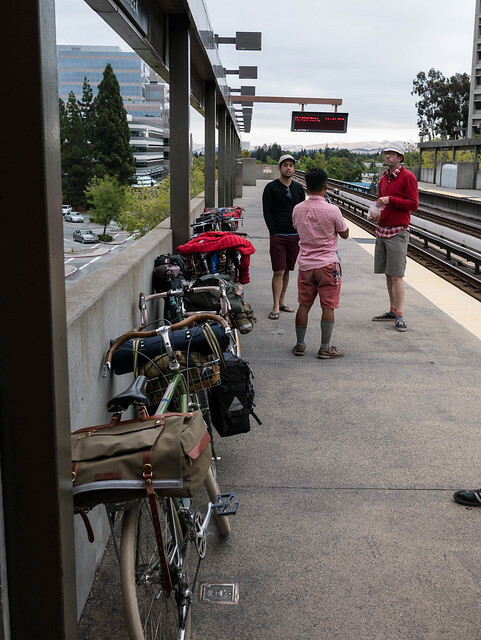 Last week, I left Seattle for a 4-day trek down the coast to the Bay area for a special ride with folks from Rivendell and the RBW Owners Bunch . 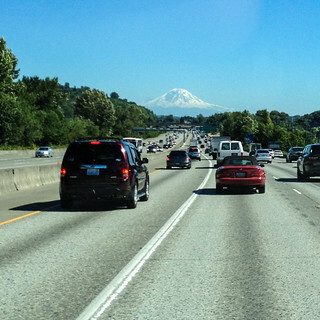 I left on Thursday around 3:30pm, and after some initial slow traffic out of Seattle, hit Portland around 7:30pm to pick up some guys from last year’s Seattle/Portland Riv Rumble. I also met the infamous Coconut Bill and Hugh Smitham from SoCal! Both were up in Portlandia scoping out a future. 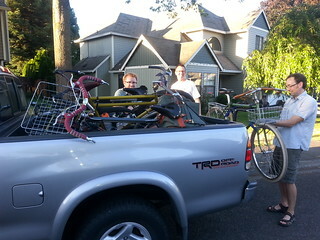 Hugh grabbed a ride with us on his return south, so we had a full truck of bikes and bike nerds! 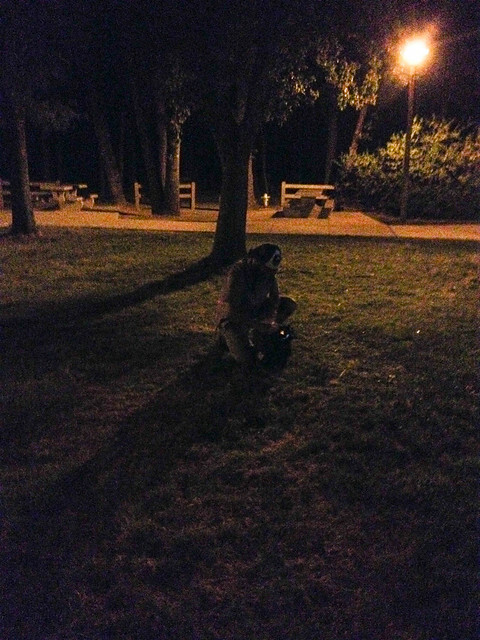 Around 2:30am we ran out of steam just south of Shasta (northern California) and pulled into a rest stop to… well… rest? We unrolled the bedrolls and slept under a tree until I felt some rain drops around 5am and sounded the alarm. 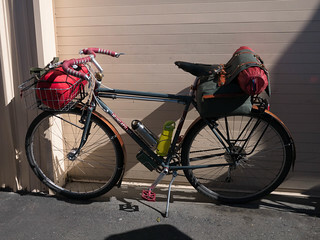 A quick pack up in the cloudburst revived us enough to make it all the way down to Rivendell World Headquarters by around 10am. It was Aaron’s first time to HQ, so he rode every bike model they had (OK, Andy and I rode a few, as well). Vince was great in accommodating us making us some tasty espresso, and helping with the bike fitting. This is where we parted ways with Hugh, who was going to meet up with some pals at Samuel P Taylor State Park on Friday night. Andy, Aaron, and I had other plans, however. We had to ditch the truck (Thanks Tommy!) 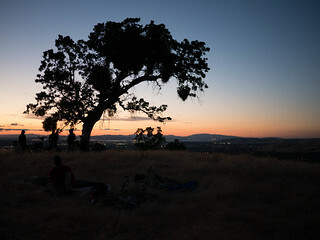 in San Leandro, and BART back to Walnut Creek for a special ride with Tommy, Manny and friends up to Shell Ridge for a bit of guerilla camping under the stars. 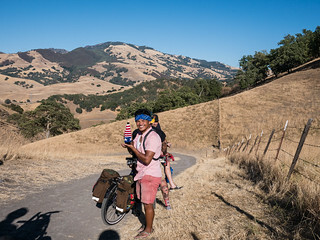 This was a serious blast, and actually an inaugural S24O for me and my Hunqapillar. I finally got to load ‘er up and ride up some hills! 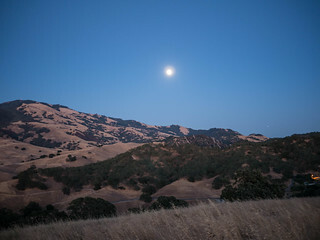 Manny (Manuel Acosta) is an active list member who is known for his photography of the local Rivendell riding grounds around the bay area (Shell Ridge, Mt. Diablo, China Camp), and his amazing adventures on his summers off with pals (he is a teacher). 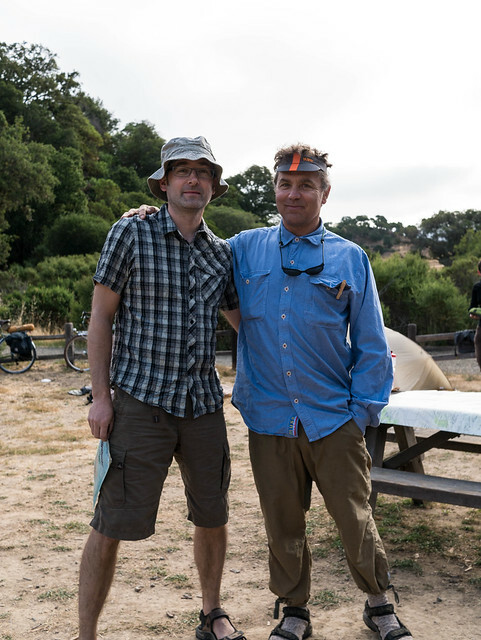 He certainly lived up to his reputation – a natural ride leader with boundless energy and enthusiasm. He welcomed all of us like old friends, and took us on some amazing trails in Shell Ridge, an area a mile away from Rivendell HQ. His Sam Hillborne is an amazing testament to hard use and beausage (beautiful usage), as well. 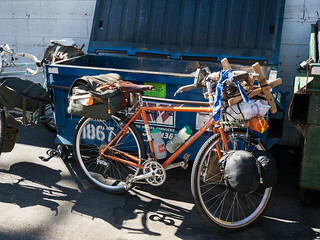 He’s done everything from camping/touring to mountain bike racing to 300k brevets on this thing. Talk about versatility! 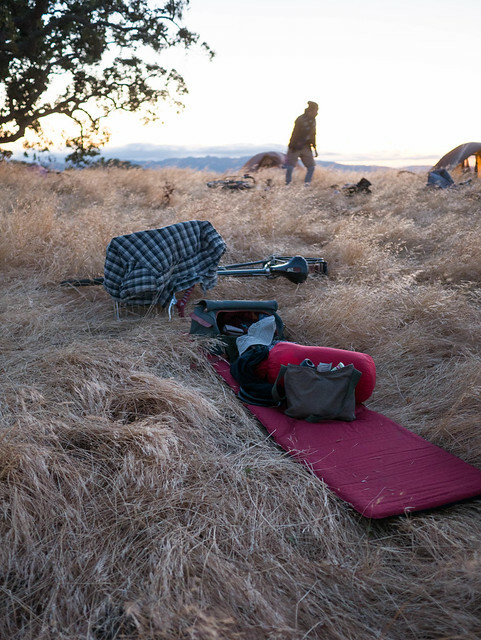 We camped out on a flat hilltop in the wind-burned dry grass. 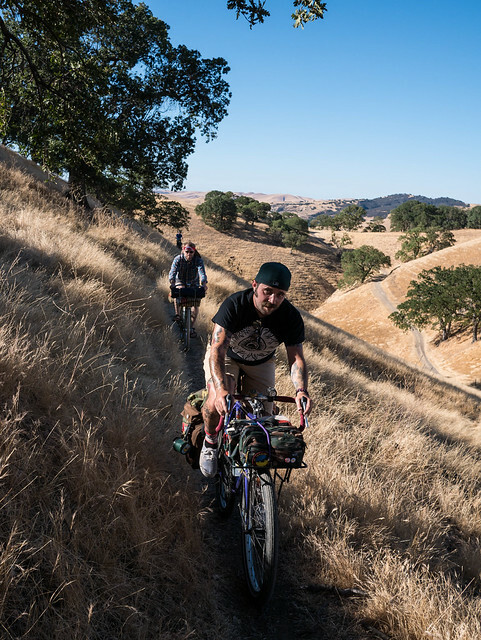 A few of us followed Manny and the locals for some mountain biking around the area, and I found out how much fun a fully rigid bike is on these trails. Even with a large basket on front, and a big back bag! Tire note – the Clement MSOs ripped it! No issues with traction or flats all weekend – and plenty of sharp objects and dusty washouts were traversed. 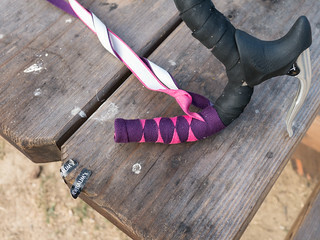 The Albastache bars were spot on for this sort of riding, as well. At this point, I was pretty popped, so sleep came quickly. We had a great breeze, and a few folks stayed up chatting into the night, but the SEA/PDX crew crashed hard. 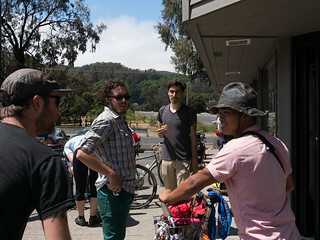 The next morning we had some coffee and a few dry bits of food, and headed back down to the BART station to rendezvous with folks in San Francisco for ride up to China Camp, the official site of the Entmoot. 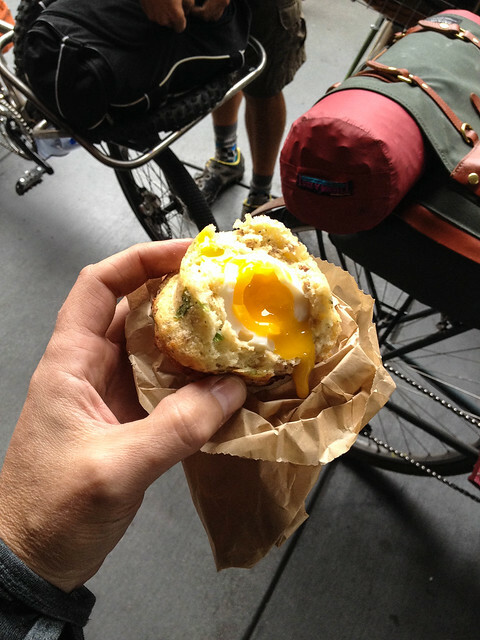 Here we loaded up on some breaky and hardy bits to bring camping, and also met the next level of the list contingent. Lots of amazing people came together for this ride. All sizes and shapes! 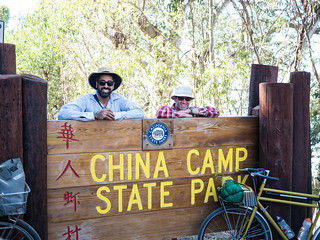 Manny (5’er) rode Amit’s (6’7″?) Bombadil, and there was much laughing. 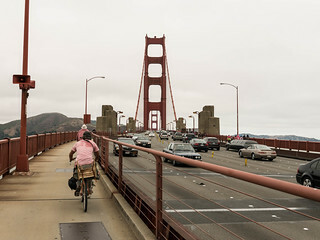 After the full assembly and some photos, we headed off to cross the Golden Gate, and rode north through Sausalito, Larkspur, and San Rafael, before arriving at our destination. 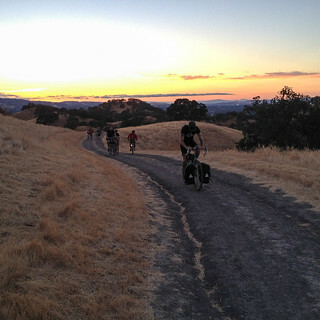 This was a fun ride – easy, low-key, and allowed us to really see the north bay area. Lots of bikes, and all were met with Manny ringing his bell, and Amit ringing and waving! This caught on to the whole group. We definitely looked a bit out of place from the lycra crowd, but everyone was friendly. 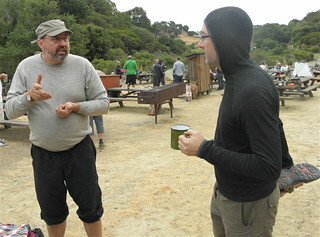 At China Camp, we found five folks from Rivendell, including Grant Petersen himself, as well as Rich Lesnik (wheelbuilder) joining us for the overnight. We got ourselves unpacked and situated, and just walked around talking and meeting all the great folks we had gotten to know only through their list posts. It’s really amazing how cool this group of folks is in person! 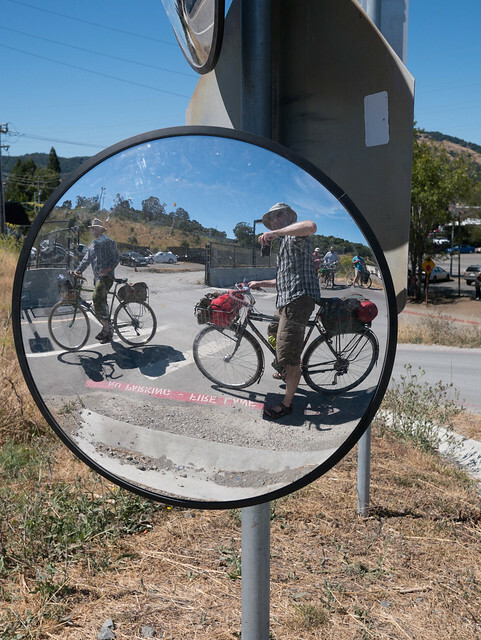 I was lined up to do a demo of harlequin bar wrapping with some bars that Joe Bunik brought along, but I had to try to catch Manny and his cohorts, who had taken off on another mountain biking trek in the hills surrounding China Camp. This riding really reminded me of the trails in Seattle, only much, much dryer! 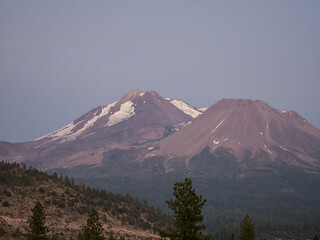 I never did catch them, but I passed a couple guys climbing the ridge in full gear on dual suspension bikes. I’m sure they were surprised by my helmetless, sandle-wearing, basket/bagged Hunqa thundering by them up the ridge. After dusting up my legs, I returned to camp and had some dinner, meeting more folks in the process, including Hugh who had returned from the other state park. 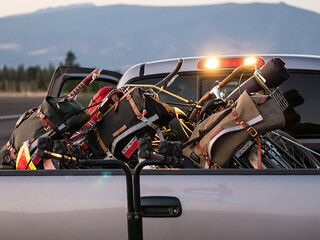 I had some great chats with Grant P about his new HAR racks and bags, and Rich Lesnick who had started his career at Boeing in Seattle. 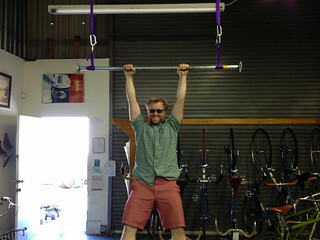 Then it was time for the bar wrapping session with Joe. This was interrupted (hope you got the bars done, Joe!) by an amazing raffle that the Riv folks held for the Entmooters. We all got a patch commemorating the event, and several of us were lucky enough to win some cool gear including soaps, bags, and even a hatchet! I came out of it with a reflective triangle for the Hunq. 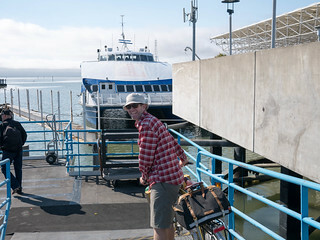 We had to hit the trail early the next morning so as to make the 9am ferry out of Larkspur. I was up pretty early, so brewed up a few shots of coffee on the Trangia. Great stove, BTW. Roger checked out my Seattle beans and compared the roast to his home-roasted batches. 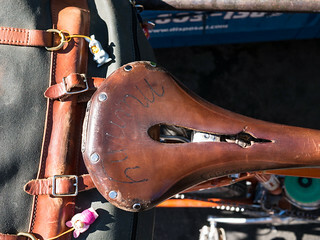 Wow – coffee and bike geekery is a common thread here. I got a couple of last goodbyes and photos with the folks that made this all happen. After some rejuvenating beverages, we headed on out for a fine morning ride back to the ferry and civilization. S48O complete! The ride back up to Portlandia and Seattle was fairly uneventful, although more could be written about this adventure as it involved cleanup and lunch bought by Tommy’s dad when we returned to the truck, a three-hour last stop at Bike, Book, and Hatchet, and a search for a good liquor store where I could find some nice Islays, and other strange drinks for Aaron (??). 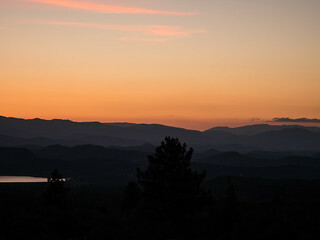 We had a beautiful sunset on the way past Shasta – it always seems to be a picturesque place when I go through this part of the country. We made it to within 90 miles before I became bleary-eyed and had to stop at another rest stop for some shut-eye. Up to Andy’s early and a goodbye breakfast at Bertie-Lou’s (um, yum!). Great trip! I really can see this becoming an annual trek. 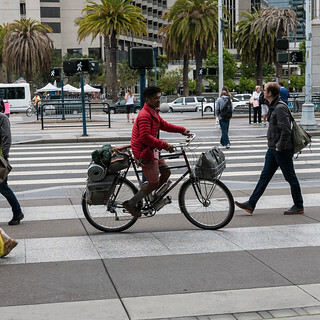 Backdrop: in 1994, Grant Petersen left Bridgestone when they folded their US bicycle operation, and started a small mail-order bicycle business that he named after a backpack company and elf city of literary fame. The business slowly grew with like-minded cyclists who feel steel, leather, lugs, and Grant’s relaxed geometry exemplifies a quality ride. As the internet became popular around the same timeframe, a newsgroup was formed and dedicated to discussions of Rivendell bikes and ethics. This branched out of the original iBOB list (Bridgestone Owners Bunch) that had quite a following. RBW was born, and has blossomed into 2000+ users. It’s a real community of like-minded, friendly folks from around the world. Great post! What an amazing experience.